TRAVIS: Hey, my name is Travis Andersen, I’m 22 years young, was born in San Diego, California and live in Las Vegas, Nevada! I go to school at UNLV, majoring in Business Accounting and I’m a manager over at a golf shop. TH: You have some of the cleanest shots out there on Instagram. What do you use as your main setup? TRAVIS: Thank you. I use a canon T3i along with a couple different lens as well. 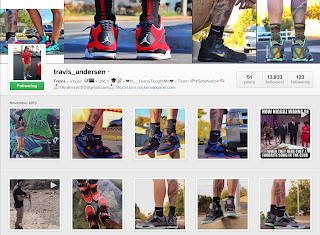 TH: Your leg tattoo has become infamous on Instagram. Can you tell us a little more about how it came to fruition? TRAVIS: My leg tattoo represents strength. There was a point in my life where I was going through a rough stretch. My grades in school were low and that was something that I wasn’t accustom to, I get A’s and B’s in school. I was in a five year relationship and it was coming to an end and it just drained me. To top it all off, I was about 290 lbs. I’ve always been the, big kid, but pushing 300 lbs, that’s the heaviest I’ve ever been. It was the unhappiest I’ve ever been in life. I felt like, what ever could go wrong, did go wrong. I even feel into a depression for a while. It was a scary time for me. I finally got my head straight and lost about 130 lbs. Hardwork and dedication is all it took. I set my mind to losing the weight and getting out of the depression and I did. It’s been a long process. It’s taught me a lot about myself. My tattoo is ripped skin with the muscle showing. What better way to show strength than walking around with your skin falling off and the muscle showing lol. But in all seriousness, I wanted something that was different, something that stood out, I wanted something that would make people stop and go “wow”. No matter how many times you get knocked down in life, as long as you get back up, you're stronger than before and that’s all that matters. TH: What has been your favorite release of 2013 so far? TRAVIS: So far my favorite release has been the Jordan Bugs Bunny VIII’s. 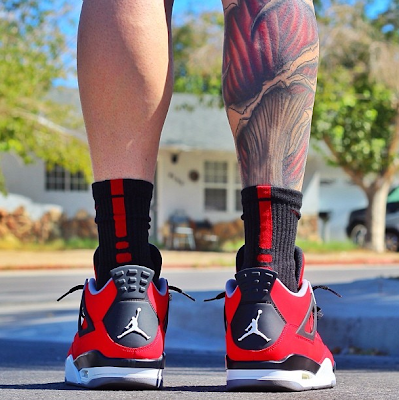 Even though out of Jordans I’m a fan of IV’s, these have real meaning behind them for me. It’s the shoe the really got me into shoes and plus, when my girlfriend, who lives in Miami came out to visit me, we were able to snap a couple sneaker pics with those on as well. Just added a little more meaning to the shoe for me. TRAVIS: Easy. Lightening IV’s. 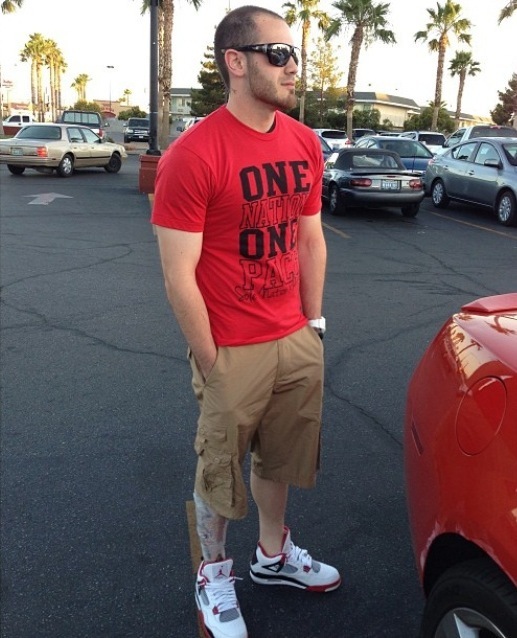 I’m a big fan of Jordan IV’s. I was 15 when they released, wasn’t able to work and didn't have a way of coming up with the money. So when I heard that they could be rereleasing this year, I got really excited. But now I'm hearing that they’re not rereleasing. TRAVIS: I’m a Miami Heat fan (been one since Wade was drafted, not a bandwagon fan like most Heat fans these days) and when the corks came out to represent LeBron winning his first championship I had to have them. With the way most releases are done, of course I missed out and had to pay resell (I have a rule I live by, DO NOT PAY RESALE prices. If I miss a shoe release, there’s going to be a lot more in the future that I’ll be able to get) for them. Took me about 7 months after release date to get them. Love that shoe. TRAVIS: Going to the gym. I go about 5-6 times a week. I go for about 2 hours a day. I’m addicted haha. TRAVIS: The way shoes are released bothers me the most. I hate it. A person needs a “bot” to get a shoe these days, it’s crazy. I remember when the LeBron “Champ Pack” was releasing, retail was $500.00 plus tax, people who ran RSVP/Bot sites were charging $500 for their services. So lets say you got the shoe using a bot, you spent $1,000 + to grab a shoe? It’s not what it used to be. I remember lining up at NIKE Las Vegas getting wristbands. They tell you a time, you show up, get a wristband and that’s it. These days it’s just not worth it anymore. TRAVIS: The same shoe that was my favorite release, sparked my interest. I remember as a kid walking around the mall with my mom and I saw the shoe, the Bugs Bunny VIII’s, sitting at a footlocker and I remember asking her if I could get them and at the time she said “no, I’m not spending that much money on a pair of shoes”. I was about 12 years old at the time and didn’t have my own money to spend. I never forgot that shoe and when I heard they were coming out in earlier this year, it was an instant grab for me. TRAVIS: Color. I like shoes that stand out. 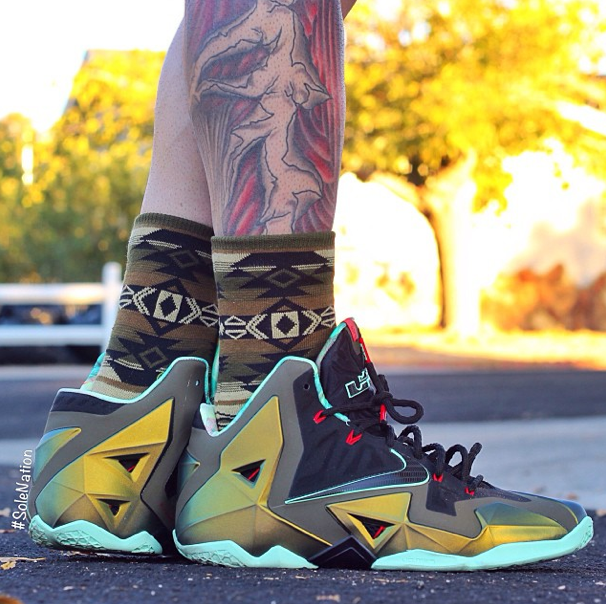 The LeBron X volt is one of those shoes that just stands out. When ever I wear them, I always catch people looking at them, it’s the funniest thing. TH: What's your favorite specific shoe/colorway from the following categories? 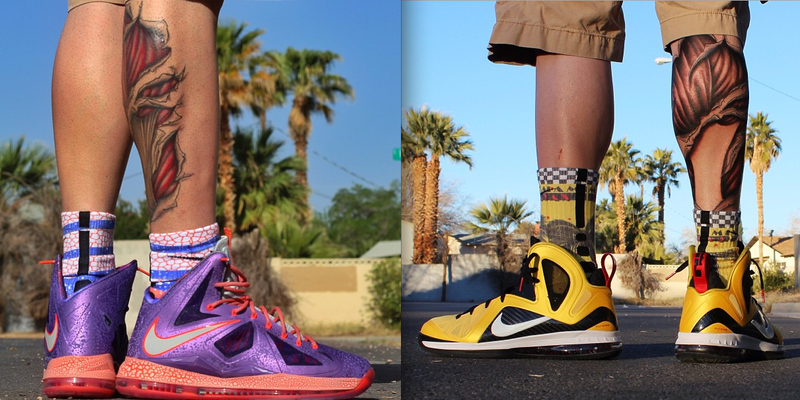 Jordan, Nike Basketball and Lebron. TRAVIS: Jordan - Red/Black color way does it for me really. 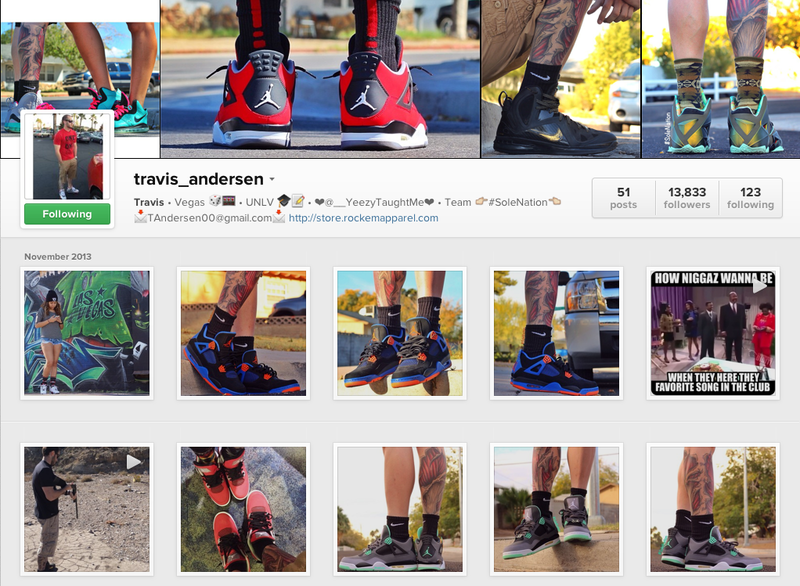 TRAVIS: There’s more to life than just shoes. 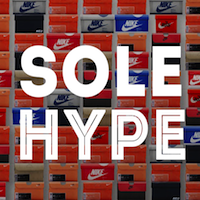 Everyone loves a new pair of sneakers, but don’t go broke buying every release. But what you like and wear it. Remember that. Don’t pretend to be someone you're not just to fit in. It’s easy to spot a fake.